Universidad de los Andes was founded in 1948, and it was the first private university in Colombia that was independent from political or religious movements or parties. It was conceived as a study center, a research center, and a place where truth could be upheld. Ever since the university was founded, its activities have focused on excellence, and this is affirmed in the Comprehensive Development Plan (CDP). It is currently the only private university in the country that has been awarded a ten-year institutional accreditation for quality by the National Ministry of Education through Resolution 582 of January 9th 2015. Universidad de los Andes was ranked eighth by the QS University Rankings 2015/2016 in Latin America, and it occupied the 283rd spot globally. Moreover, the Faculty of Management has the prestigious “Triple Crown”, which consists of three accreditations (EQUIS, AMBA, and AACSB); this is only held by 1% of business schools around the world. Additionally, eight undergraduate programs in the Faculty of Engineering have the International ABET accreditation. The student community is made up by 14,470 undergraduates, 3,495 postgraduates, 436 PhD students, and 723 Postgraduate Diploma students. There are 661 full-time teaching staff and 887 part-time teaching staff. There are 143 research groups that are registered by Colciencias, 39 of which are in category A1, 17 are in category A, 29 are in category B, 44 are in category C, 12 are in category D, and 2 have not been classified. The Universidad de los Andes, following its founding principle of working to develop Colombia, has created a financial support system. Since 2006, this system has helped 1,709 students studying different undergraduate programs. 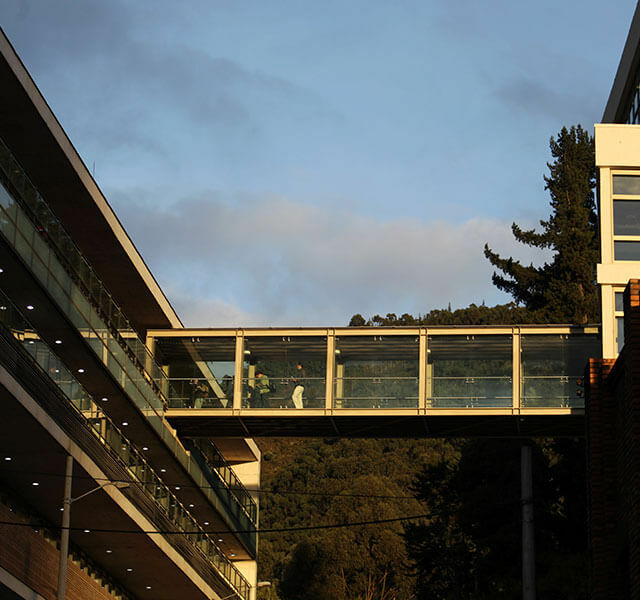 The university is located in the heart of Bogotá, and it hosts 176,000m2 of buildings and 50,000 m2 of green spaces, including 22,000m2 of wooded area. As well as classrooms, the university has 163 laboratories for teaching and research, a 600-person auditorium, two rooms for art exhibitions, a sports center with a semi-Olympic swimming pool, and facilities to undertake 45 different types of physical activity.